It’s not climate change. It’s science being manipulated to drive and justify energy policy. I told my students that data is king, and models are only useful tools. Any model’s output or any theory needed to be examined and validated using data, and must always be used with caution. The “greenhouse theory” being used to change the world fails the test in many ways. First of all, many scientists question CO2 as being ‘the climate driver’ and a danger to humanity. Dr. Patrick Moore, PhD Ecologist and co-founder of Greenpeace, testified before a US Senate committee in February 2014. What then makes it an absolute law of nature that carbon dioxide levels above 350 parts per million (0.035 percent of Earth’s atmosphere) will be catastrophic, as so many alarmists now say? The “more than 350 ppm CO2 will cause planetary disaster “hypothesis” was put to the test with observations. A large team of unbiased climate scientists and I examined the three main tenets of the model-based “science” that EPA uses to justify its energy and climate regulations. We reported to the Supreme Court in a brief that each one has failed the test. * There has been no warming for close to 19 years, according to satellite and weather balloons measurements, despite an increase of over 10% in atmospheric CO2. * The strong warming that all the climate models forecast in the tropical high atmosphere and the tropical oceans simply does not exist. * Even NOAA and the IPCC have now admitted that there has been no upward or downward trend in droughts, floods, hurricanes and tornadoes. Only snow has increased - and the models had projected that snowfalls would be the only extreme weather event that would decline. However, pressured by the White House, the EPA, NOAA and NASA continue to use these faulty models to predict a dire future and move us away from fossil fuels. And thanks to unprecedented funding of billions of dollars, university scientists are gladly supporting this effort and the dire forecasts. NOAA recently warned of an increase in heat waves and heat wave deaths. The reality is the heat peaked in the first half of the twentieth century and has been declining since then. In fact, 23 of the 50 states’ all-time record highs occurred in the 1930s, with 38 coming before 1960. 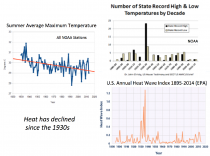 There have been more all-time cold records than heat records since the 1940s. 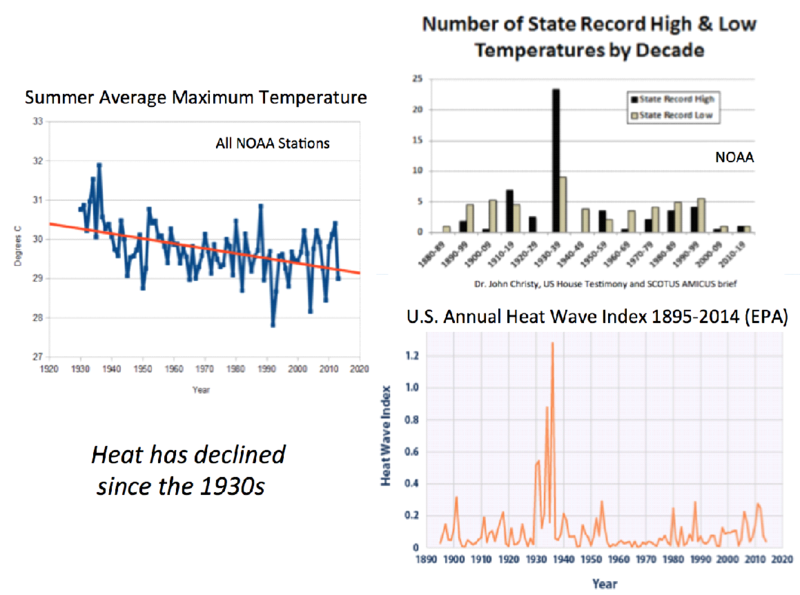 As the graphs demonstrate, the number of 95-degree F days and widespread heat waves has been trending down since the 1930s. For every continent, the all-time heat records were set in the 1800s to mid 1900s. Also totally ignored is the inconvenient fact that cold kills more people than heat. A rigorous study published last year in the medical journal Lancet examined more than 74 million deaths in 384 locations across 13 areas: cold countries like Canada and Sweden, temperate nations like Spain, South Korea and Australia, and subtropical and tropical ones like Brazil and Thailand. It found that 20 times more people worldwide died from cold than from heat. Government reports, writers of opinion pieces, and bloggers posting graphs purporting to show rising or record air temperatures or ocean heat, are misleading you. This is not actual raw data. It is plots of data that have been “adjusted” or “homogenized” (ie, manipulated) by scientists - or it is output from models that are based on assumptions, many of them incorrect. UK Meteorological Office researcher Chris Folland makes no apologies for this. But models are useful and valid only if their outputs or forecasts are confirmed by real-world observations. What’s more, these data plots were prepared by the same organizations that are responsible for producing the model forecasts. The fox is running the hen house. Actual, original data have been changed so much and so often that they are almost unrecognizable from the original entries. For example, the 0.7 degree Celsius (1.3F) of cooling between 1940 and the 1970s - which had the world worried about another Little Ice Age - has simply “disappeared” in these corrupted-computer-model re-writes of history. Within a few more years, though, temperatures began to rise - and suddenly “climate experts” were warning that fossil fuels were going to warm the planet uncontrollably. Arctic sea coasts, they began to say, had far less ice and were in danger of being ice-free year-round. 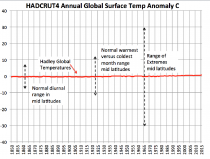 To underscore their concern, they exaggerate warming charts, by stretching the scale, to make any recent warming look far more significant than it actually is. 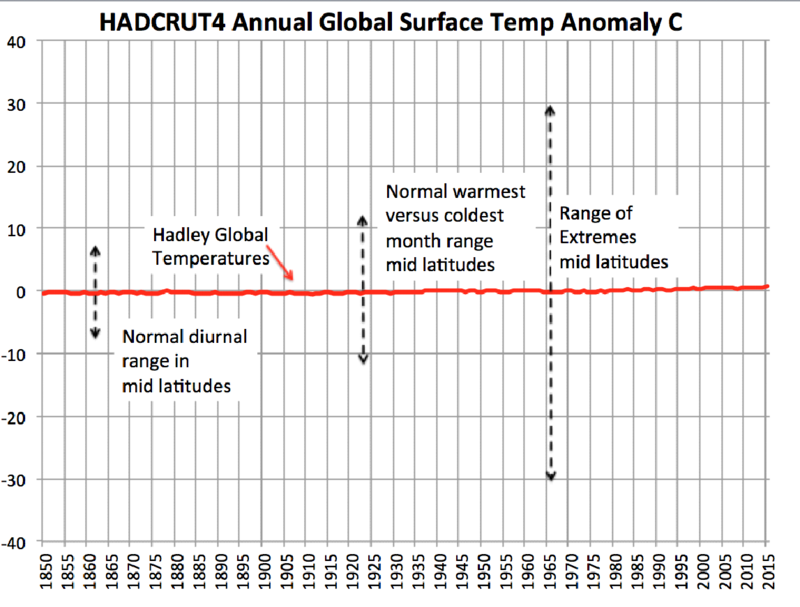 Moreover, the claimed 1-degree-plus-or-minus warming needs to be put into perspective. Here in the north, air temperatures often change more than 30 degrees F in a single day, monthly average temperatures vary more than 50F from January to July, and highest and lowest temperatures can vary as much as 125 F.
Who is pushing this end-of-hydrocarbon-energy to prevent an end-of-world-calamity agenda? The list is long and includes politicians and UN globalists (look up Agenda 21) who seek more power and control over every aspect of your life. Scientists, environmentalists, green NGOs and corporations are all chasing the $1.5 trillion per year that feeds the climate crisis and renewable energy industry. The lengthy list also includes scientifically illiterate population control socialists and Hollywood cause seekers, who are all supported by environmental journalists who never question any “green” causes or scare stories. Many use the “precautionary principle” to justify drastic actions that perversely have truly drastic consequences, intended or unintended. Eco-fanaticism has already pummeled Europe. In the past ten years, the price of electricity in Europe has climbed by an average of 63 percent. Polling indicates that 38% of British households are cutting back essential purchases like food, to pay high and rising energy bills. Another 59% of homes are worried about how they will pay energy bills when the Paris accord is enforced. Poor and middle class families are impacted worst of all. 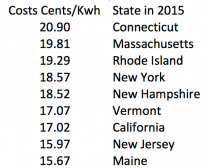 Families and businesses in the “Blue States” in the Northeast already pay the highest electricity prices in the United States - twice that of some other states. 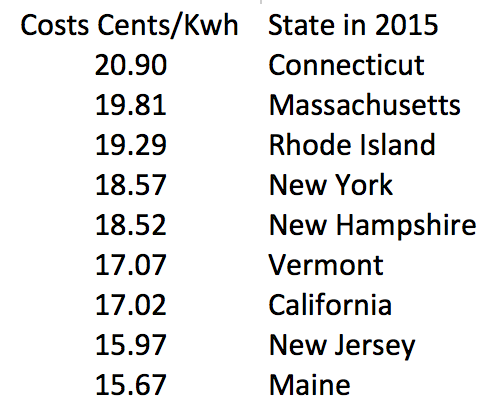 The changes the EPA and this administration are pushing could double those rates - and the rates in other states. The thousands of dollars that an average Northeastern family saved on gasoline and heating oil in 2015, thanks to fracking and drilling on private land, was truly welcomed as the only ‘raise’ that many families got in many a year. However, that too will be a memory, if the EPA’s plans are not blocked by the courts - or a President Trump. Moreover, if elected president, Hillary Clinton and Bernie Sanders both plan to eliminate fracking, as well as most conventional oil and gas drilling and production. With a Hillary Clinton administration and newly Democrat Congress promising to kill fracking and eliminate, hyper-regulate and/or over-tax fossil fuels, energy costs per family would increase thousands of dollars a year. This happened in Europe when the greens took control. Moreover, soaring energy prices ripple through the entire economy, affecting the cost of all goods and services - including products and services provided by factories, hospitals, schools, small businesses and the shipping of food and other products. Soaring energy prices kill jobs and depress living standards, as companies and communities find they must come up with thousands to millions of extra dollars every year, just to keep the lights, heat and air conditioning on and machinery humming. That means more industries will head overseas, where energy costs and workers’ wages are far lower, while millions of Americans will be relegated to part-time positions, service jobs at far less than they had been getting, or welfare and unemployment benefits for the newly and perhaps permanently jobless. Meanwhile, the United States will be expected to send billions of dollars to poor countries and emerging economies, as climate change “reparation, mitigation and adaptation” payments, under the new Paris climate treaty. And those now relatively poor nations, including China and India, will be still burning fossil fuels and taking away our jobs, to lift their people out of poverty. All the sacrifices by Americans, Europeans and families in other now-developed, now-rich countries will be for naught. This is what the so-called “progressives” want and are marching in the streets to get. Former Washington State Democratic governor Dixy Lee Ray saw the second Treaty of Paris coming many years ago. Our aim is not to save the world from ecological calamity but to change the global economic system… This is probably the most difficult task we have ever given ourselves, which is to intentionally transform the economic development model, for the first time in human history. In simpler terms, she intends to replace free enterprise, entrepreneurial capitalism with UN-controlled, centralized, socialized One World government and economic control. In November 2010, IPCC official Ottmar Edenhofer presented an additional reason for UN climate policies. In addition to everything else that is wrong, destructive and simply perverse about energy and climate policies, these are truly scary developments. And to top it all off, the Obama administration’s Justice Department is now seriously considering the idea of joining state attorneys general in prosecuting companies, organizations and individuals who dare to think independently and refute claims that human-driven global warming is the greatest danger of all to our future well-being. All of this sounds a lot more like pre-world war two Germany than the United States of America. It is certainly a trend that we should worry about far more than any honestly conceivable threat from any nearly imperceptible human contribution to the climate changes that have always buffeted humanity and our planet. We with a large team of scientists and economists and lawyers recently published a detailed scientific brief to the courts battling bad science. It was the 5th such brief the last 5 years, all of them pro-bono like with these postings elsewhere like Master Resource, Patriot Post and the local weeklies in New England as we try to educate as many people as we can to the truth and the pains associated with the punitive regulations and policies pushed by the radical environmentalists and politicians. Please help us if you can through your donations (button on the left).